OK silence as far as psychiatry goes. For the past ten years we have heard both individual psychiatrists and monolithic psychiatry maligned for accepting Big Pharma cash for presentations, expert consultations, or whatever. The implications being twofold - that there were no legitimate reasons why a physician seeing patients should be in the employ of a pharmaceutical company and (courtesy of the Institute of Medicine) that since you can't really tell what is a real conflict of interest versus the appearance conflict of interest without some additional leg work that we should just consider any potential conflict of interest an actual conflict of interest. At that point, the body in the US with the most real conflicts of interest that I can think of (Congress) decided that all payments from pharmaceutical companies and device makers should be catalogued in a data base for everyone to see. When I accessed the database, it was a clear example of government information technology (IT) at its worst. There are numerous examples of government IT projects being abandoned as unusable after an investment of hundreds of millions of dollars. The recent hacks exposing the private information of millions of government employees and millions of classified documents are good examples of the lack of quality in government IT. Why expect any higher bar with payment disclosures to physicians? Rather than navigate the unnavigable, a better approach is to look at secondary data sources who have the time and staff required to translate the data like Pro Publica. On their opening web page there is a small window half way down that asks: "Has Your Health Professional Received Drug Company Money?" I plugged in my name as a double check on the system and it returned 27 results with either a first or last name George or a last name Dawson. None of them was me (which is accurate). Only one of them was a psychiatrist and that physician had received a total of $88. The remaining physicians had received anywhere from 0 to $18,450. I would certainly not be very happy if I was included in this database for receiving zero dollars and wonder how often that mistake is made? The bar graph of what types of fees were paid by the industry is instructive. The largest single group of payments were for "Royalty or License" and number of current brand name chemotherapy and antiviral drugs were mentioned. The next category was "Promotional Speaking". I can't imagine that rheumatologists, endocrinologists, and cardiologists are not in demand to speak to primary care physicians about the latest developments in their fields. I have spoken at Primary Care Updates in psychiatry for primary care physicians. Are those presentations classified as "Promotional Speaking" if a pharmaceutical company sponsors it and the speaker does not mention one of their products by name? I have similar questions about "Consulting Fee". If a physician has a specific expertise and is paid by the private company for that expertise, in my opinion they are no different than any other University faculty in similar positions. The idea that a physician's entire life is encompassed in relationship with patients and that this is somehow a sacred trust is a myth that is perpetrated by concerns who are quite willing to exploit all physicians on that basis. They are all listed in various places on this blog. "The nation's 3,900 rheumatologists in the data averaged 40 days of interactions with drug and device companies, more than doctors in any other large specialty. They were followed closely by endocrinologists, electrophysiologists and interventional cardiologists...." In my home state of Minnesota they list the top 20 physicians receiving money from pharmaceutical and device companies and 19/20 are surgeons (orthopedic, spine, eye) and one is a cardiologist. That is a curious phenomenon considering how frequently psychiatrists are maligned for financial conflicts of interest in the popular media and blogosphere. No Senate investigations of rheumatologists, endocrinologists, neurologists, or cardiologists? No attacks on their professional organizations? No suggestions that their diagnoses, interventions, prescriptions, publications or professional behavior are questionable based on their reimbursement from private industry? Why is that exactly? I certainly have plenty of good ideas. In order to clarify the real picture here, I sent an e-mail to Charles Ornstein, the lead author of the "A Pharma Payment A Day..." article. I asked him to post the statistics by specialty including the percentages of physicians getting some payment, per capita payments or by whatever metric they chose. Considering the scope of payments suggested by these tables, my speculation is that there will be several physicians in the tens of millions of dollars category and that none of them will be psychiatrists. But I am content to wait to see if he posts those results. Until then, don't ever believe that what you read about psychiatrists is a random event free from the usual antipsychiatry biases. No matter what happens with the Pro Publica data - don't believe that anyway. 1. Charles Ornstein and Ryan Grochowski Jones. A Pharma Payment A Day Keeps Docs’ Finances Okay. ProPublica Web Site. from: CONVERGE consortium. Nature. 2015 Jul 15. doi: 10.1038/nature14659. [Epub ahead of print] - see complete reference 1 below. This is an interesting effort from a large number of researchers looking at candidate genes in major depression. The authors studied major depressive disorder (MDD) in 5,303 Han Chinese women selected for recurrent major depression compared with 5,337 Han Chinese women screened to rule out MDD. The depressed subjects were all recruited from provincial mental health centers and psychiatric departments of general hospitals in China. The controls were recruited from patients undergoing minor surgical procedures in general hospitals or from local community centers. All of the subjects were Han Chinese women between the ages of 30 and 60 with four Han Chinese grandparents. The MDD sample had two episodes of MDD by DSM-IV criteria. 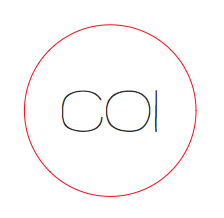 The diagnoses were established by computerized assessments conducted by postgrad medical students, junior psychiatrists, or senior nurses trained by the CONVERGE team. The interview was translated into Mandarin. Exclusion criteria included other serious medical of psychiatric morbidity (see details in ref 1). Whole genome sequences were acquired from the subjects and 32,781, 340 SNPs were identified, 6,242,619 were included in genome-wide association studies (GWAS). Figure 1 above is the quantile-quantile plot for the GWAS analysis resulting from "a linear mixed model with genetic relatedness matrix (GRM) as a random effect and principle components from eigen-decomposition of the GRM as fixed effect covariates." I won't pretend to know what that methodology is, even after reading the Methods, Supplementary Notes section. I expect that it would take a more detailed explanation and in the era of essentially unlimited online storage capacity, I would like to see somebody post it with examples. Without it, unless you are an expert in this type of analysis you are forced to accept it at face value. I am skeptical of manipulations of data points that provide a hoped for result and can cite any number of problems related to this approach. On the other hand information of this magnitude probably requires a specialized approach. 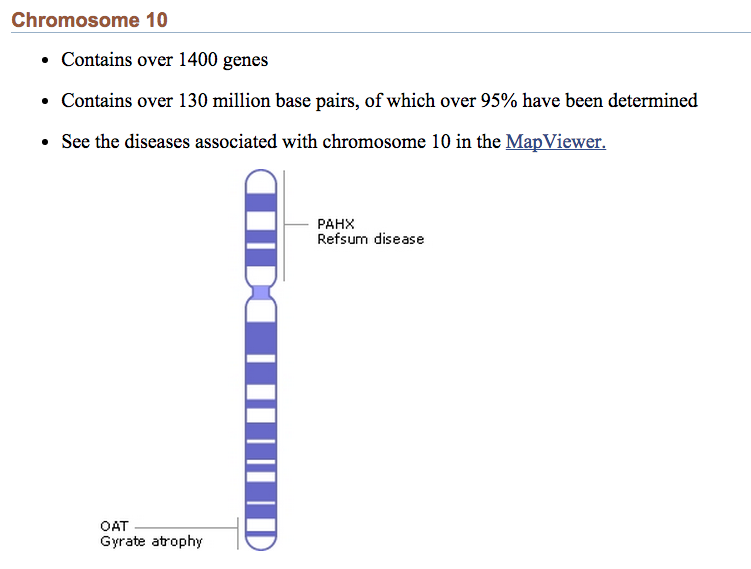 In this case the authors found two loci on chromosome 10 that contributed to the risk of MDD. They replicated the findings in an independent sample. One of the features that I liked about this paper was the focus on patients with severe depression. I have lost count of the number of papers I have read where the depression rating scores were what I consider to be low to trivial. Many rating systems used in clinics seem to use these same systems for determining who gets an antidepressant and who does not. Whenever I see that, I am always reminded of the "biological psychiatry versus psychotherapy" debates that existed when I was in training in the 1980s. Once of my favorite authors at the time was Julien Mendlewicz and anything he would publish in the Journal of Clinical Endocrinology and Metabolism (4-6). There is a table in one of his studies with the HAM-D scores of the patients with unipolar depression he was seeing that ranged from 30-57 with a mean of 41+/- 10. For bipolar patients in the same study the range was 30-43 with a mean of 36 +/- 5. One of those patients could not be rated initially because of severe psychomotor retardation. These are levels of depression that are not typically seen in depression research from either the standpoint of basic science and probably never for psychopharmacological research. Much of the research that I am aware of allows for the recruitment of patients with HAM-D scores in the high teens and low 20s. I don't think that is the best way to run experiments on biologically based depressions or antidepressant medications, but there is rarely any commentary on it. The CONSORT group in this paper finally comments on this factor as being a useful experimental approach even though Mendlewicz was using it in the 1980s. The second issue that crops up in the paper is replication. The authors validate their original work by running a second sample for validation. That is the approach we would use in analytic chemistry. If we were using a new technique we would run samples in triplicate or in extreme cases in sets of 5 to make sure we could replicate the analysis. It reminded of one of the first great genetic marker papers in the field that was published in the New England Journal of Medicine by Elliot Gershon's lab in 1984 (2). It was an exciting proposition to consider that fibroblasts could be grown from a skin biopsy and the muscarinic cholinergic receptor in those fibroblasts would be a marker for familial affective disorder. The general observation in this pilot study of 18 patients was that they had an increased muscarinic receptor density in fibroblasts compared to controls and that the relatives with histories of minor depression had receptor densities that were more similar to the subjects with mood disorders than normal controls. The subjects with familial affective disorder were defined as subjects with bipolar I, bipolar II, or major depression according to Research Diagnostic Criteria (RDC). No rating of depression severity was made acutely or on a historical basis. These findings could not be replicated, in the end even by the original lab. That process played out in the pages of the New England Journal of Medicine (3) and the original findings were withdrawn. It would be interesting to look at how often a similar debate occurs in a prestigious journal these days. Estimates of non-replicable findings by the pharmaceutical industry suggests that it should happen a lot more often. In terms of the original paper, the sheer amount of information involved in the genetic code is staggering. Just looking at the 130 millions base pairs on Chromosome 10 and thinking about combinations of 2, 3, 4, 5, or 6 base pairs yields the numbers in the table below entitled "Combinations of 130 million base pairs." The exponential notation ranges from 1015 to 1045 or a quadrillion to a quattuordecillion combinations. Figuring out the best way to determine which combinations are relevant in illnesses with polygenic inheritance will be an interesting process. 1: CONVERGE consortium. Sparse whole-genome sequencing identifies two loci for major depressive disorder. Nature. 2015 Jul 15. doi: 10.1038/nature14659. [Epub ahead of print] PubMed PMID: 26176920. 2: Nadi NS, Nurnberger JI Jr, Gershon ES. Muscarinic cholinergic receptors on skin fibroblasts in familial affective disorder. N Engl J Med. 1984 Jul 26;311(4):225-30. PubMed PMID: 6738616. 3: Failure to Confirm Muscarinic Receptors on Skin Fibroblasts. N Engl J Med 1985 Mar 28; 312: 861-862 PubMed PMID: 3974670. 4: Linkowski P, Mendlewicz J, Kerkhofs M, Leclercq R, Golstein J, Brasseur M,Copinschi G, Van Cauter E. 24-hour profiles of adrenocorticotropin, cortisol, and growth hormone in major depressive illness: effect of antidepressant treatment. J Clin Endocrinol Metab. 1987 Jul;65(1):141-52. PubMed PMID: 3034952. 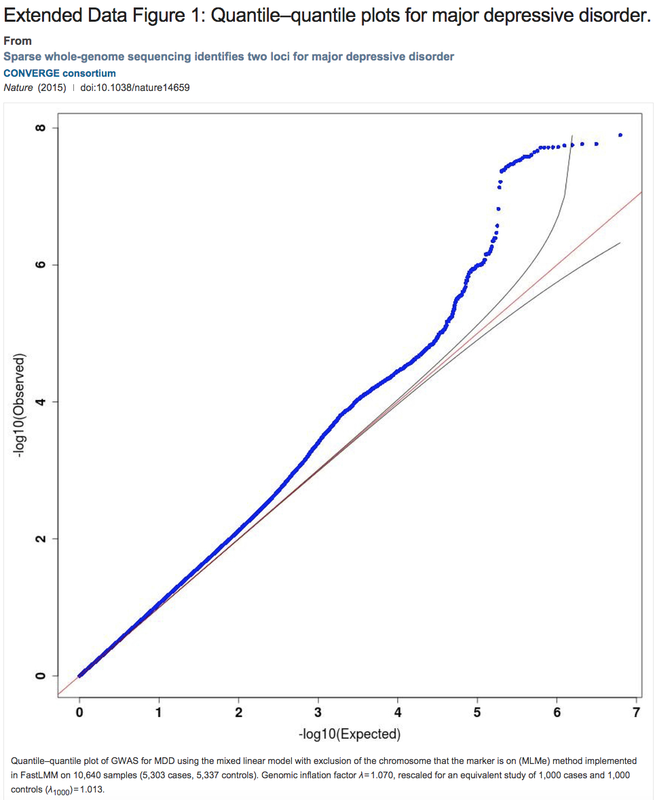 5: Linkowski P, Mendlewicz J, Leclercq R, Brasseur M, Hubain P, Golstein J, Copinschi G, Van Cauter E. The 24-hour profile of adrenocorticotropin and cortisol in major depressive illness. J Clin Endocrinol Metab. 1985 Sep;61(3):429-38. PubMed PMID: 2991318. 6: Mendlewicz J, Linkowski P, Kerkhofs M, Desmedt D, Golstein J, Copinschi G, Van Cauter E. Diurnal hypersecretion of growth hormone in depression. J Clin Endocrinol Metab. 1985 Mar;60(3):505-12. PubMed PMID: 4038712. Extended Data Figure 1 is from: CONVERGE consortium. Sparse whole-genome sequencing identifies two loci for major depressive disorder. Nature. 2015 Jul 15. With Permission from Nature Publishing Group © 2015. License number 3672900044284. Figure 1. from Shaw M, Hodgkins P, Caci H, et al. A systematic review and analysis of long-term outcomes in attention deficit hyperactivity disorder: effects of treatment and non-treatment. BMC Med. 2012 Sep 4 10:99 (see ref 6 below). One of the main concerns in the treatment of Attention-Deficit/Hyperactivity Disorder (ADHD) is whether treatment improves outcomes. The outcomes measure of interest may depend on the clinical population that you are focused on treating. In primary care settings, my impression is that a lot of the adults treated by internists are relatively stable and that they do not have a lot of problems with other mental illnesses or addictions. That is my speculation based on some of the numbers of adults I have heard are seeing primary care physicians and the fact that seeing those numbers with even a fraction of patients who have additional psychiatric problems or addictions would be unsustainable. I have also directly observed the pattern that many patients who are discharged from primary care for stimulant overuse or psychiatric complications like mania end up seeing psychiatrists. As a psychiatrist working in a residential setting that treats substance use problems - trends in overprescribing, misdiagnosis and confusion about the concept of addiction and ADHD treatment are readily observed. It is very clear that people with clear ADHD can misuse stimulants and continue to insist on using stimulants. It is clear than many of these people develop insight into this and can say at one point that they can no longer take stimulants even though they have a bona fide ADHD diagnosis. It is also clear that there is a lot of confusion among treating professionals about the issue of whether or not a stimulant should be prescribed to a person with an addiction. There is a lot of overlap between the diagnosis and treatment of Attention-Deficit/Hyperactivity Disorder and addiction or substance use disorders. Discovering this overlap depends on clinical experience, training and exposure to patients with addictions. 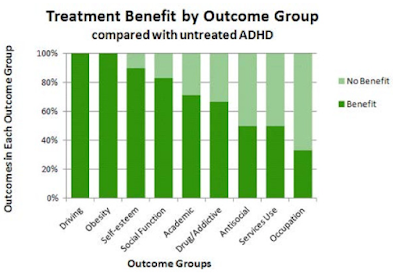 It is fairly common to read studies about ADHD outcomes that may not look at addictions as outcomes. Like many areas in medicine, some of the early studies in this area have not been borne out by subsequent studies. The study of this problem has only been a relatively recent endeavor. The original AHRQ report in 1999 (1) looked at 77 randomized controlled clinical trials included in the time period from 1971 to 1999. Half of the studies were published since 1990. At that time there were only 13 adult studies. The outcome variables were generally improvement on symptomatic rating scales, neuropsychological tests or educational achievement tests. Connor's review (2) looks at the studies prior to 2006. At the time he states that there were a total of 14 studies that looked at potential abuse issues. One of the studies supported the idea of behavioral sensitization or stimulant administration leading to craving and eventual self administration. That study did not control for Conduct Disorder, a comorbid condition that increase the risk of substance use disorders. The other studies found no increased risk, and in some cases a decreased risk of substance use disorders. There were no review elements that looked at addictions or substance use disorders. A meta-analysis of 6 studies by Wilens, et al showed a 1.9 fold reduction in risk in the stimulant treated patients. Connor's conclusion is that "...in uncontrolled environments, active substance abuse is a relative contraindication to prescribing stimulant medications." the use of atomoxetine or antidepressants with a known efficacy for ADHD was encouraged (p. 626). A more recent review by Shaw, et al from 2012 takes a different approach. The authors looked at studies between 1980 and 2010 with a minimum follow-up period of two years or more (prospective or retrospective) or cross sectional studies that compared two ages differing by two years of more. Nine separate outcome measures were examined as indicated in Figure 1 at the top of this page. Since some studies reported more than one outcome measure, a total of 636 outcomes were examined from the 351 studies reviewed for this paper. Drug use or addictive behavior was one of the most frequently examined outcomes with a total of 160 results. The next most frequent result was academic functioning with 119 results. The data is represented as percentage comparisons as improved, similar, or poorer than the comparators. As an example in Figure 1, the last 4 categories show that treatment was beneficial in 67% of the drug/addictive, 50% of the antisocial, 50% of the service use outcomes, and 33% of the occupational outcomes. The authors conclude that in these four treatment groups there was no benefit conferred by treatment. They looked at the issue of treatment of these four groups in the rest of the world and found that there was substantially better outcomes for this subgroup. There were significant methodological problems noted in the studies including the need to control for Conduct Disorder, Oppositional Defiant Disorder, and a number of other comorbid psychiatric disorders. Other potential comparison issues between the American and non-American studies included the fact that the American studies were largely prospective, the non-American studies used more stringent ICD-10 codes. One of the main variables that addiction psychiatrists are focused on clinically is when the addiction is established. Did it occur before, during, of after the ADHD diagnosis in childhood? What does that spectrum suggest for the impact of stimulant treatment on an addiction outcome? Where does all of this leave clinicians today? It is possible to find clinicians who believe that they are treating addiction with stimulants because they are reducing impulsivity associated with ADHD. There are also clinicians who believe that stimulants must be avoided at all costs, even in people with a diagnosis of ADHD. Is there a rational approach to discuss what is known about the diagnosis and treatment with the patient as part of their overall treatment program that might optimize treatment outcomes? I think that there is and have written it down in this worksheet entitled 28 Discussion Points for Stimulant Treatment of ADHD. The worksheet is intended to address problematic diagnosis as the first point of variance. It discusses the relevant addiction and safety considerations. There is also a framework for exploring the decision to use a stimulant in the broader context of a treatment plan that may include non-medical therapists and treatment programs and housing programs that may limit or prohibit the patient from using stimulants. It does not incorporate the therapeutic alliance and overprescribing considerations. One of the most difficult tasks for physicians is not prescribing a medication with addictive potential when a person believes it is necessary for their life or they are demanding it. Remembering that people with addictions are compelled to take stimulants whether they improve outcomes or not is an important part of providing quality care to this population. 1: Jadad AR, Boyle M, Cunningham C, et al. Treatment of Attention-Deficit/Hyperactivity Disorder. Evidence Report/Technology Assessment No. 11 (Prepared by McMaster University under Contract No. 290-97-0017). AHRQ Publication No. 00-E005. Rockville, MD: Agency for Healthcare Research and Quality. November 1999. 2: Connor DF. Stimulants. In: Barkley DF. Attention-Deficit Hyperactivity Disorder: A Handbook for Diagnosis and Treatment. 3rd ed. New York, NY. The Guilford Press, 2006: 608-647. 3: Barkley RA, Fischer M, Smallish L, Fletcher K. Does the treatment of attention deficit/hyperactivity disorder with stimulants contribute to drug use/abuse? A 13-year prospective study. Pediatrics. 2003 Jan;111(1):97-109. PubMed PMID: 12509561. 4: Wilens TE, Faraone SV, Biederman J, Gunawardene S. Does stimulant therapy of attention-deficit/hyperactivity disorder beget later substance abuse? A meta-analytic review of the literature. Pediatrics. 2003 Jan;111(1):179-85. PubMed PMID: 12509574. 5: Biederman J, Monuteaux MC, Spencer T, Wilens TE, Macpherson HA, Faraone SV. 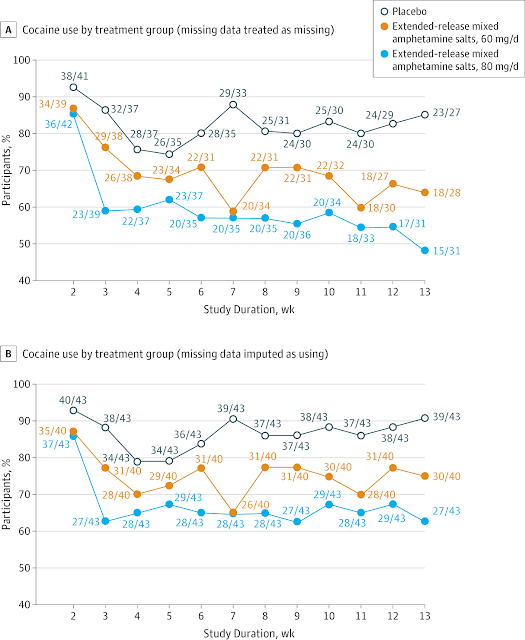 Stimulant therapy and risk for subsequent substance use disorders in male adults with ADHD: a naturalistic controlled 10-year follow-up study. Am J Psychiatry. 2008 May;165(5):597-603. doi: 10.1176/appi.ajp.2007.07091486. Epub 2008 Mar 3. PubMed PMID: 18316421. The graphic at the top of this post is from reference 6 above and is posted per the open access license at that site. The words popped up this week in two separate journals that I read regularly. In the New England Journal of Medicine, there was an opinion piece on Placebo Effects in Medicine. In the Journal of Clinical Psychiatry there was an article on Nocebo Effects in the Treatment of Major Depression. Most people are familiar with the definition of placebo, or an apparent therapeutic effect from an otherwise inert medication or therapeutic intervention. Even though the nocebo effect has been known for some time, it is less familiar. A nocebo effect is an apparent adverse reaction to an inert substance. I first became aware of it about 30 years ago as a clinical investigator working on a double blind placebo controlled study of an experimental anxiolytic medication. In that study, the blind could be broken and the research subject informed of whether they were receiving active drug or placebo. I had to inform several distressed subjects that they were receiving placebo after they insisted on stopping the study due to medication side effects. In clinical practice, nocebo effects are also apparent typically as adverse reactions to low doses of medication or very atypical responses to medication. In clinical practice, the determination is always probabilistic because placebos can't be given. In the nocebo paper (1), the authors analyze treatment-emergent adverse events (TEAEs) in 1,565 or 2,457 placebo treated participants in 20 industry sponsored, randomized, placebo controlled trials of duloxetine. There were 16 different study designs typically in terms of length. The Hamilton Depression Rating Scale (HDRS) was the primary outcome measure in 17 of the trials. The authors looked at worsening ratings of depression score, TEAEs, and discontinuation rates. The authors hypothesized that prior conditioning by previous treatments (especially within the same class of drug) and negative expectations regarding treatment might predict nocebo responses. They could find no results to support either of these theories. The nocebo response has clear implications for interpreting the results of clinical trials in psychiatry and clinical practice. Nocebo has really not been a term in the discussion, even by some authors who have basically declared that there is no antidepressant response (3). Practically all of the naysayers doing meta-analyses to prove that antidepressants don't work don't include any discussion of it in their work. All that you hear is that there is really no difference or not much difference between active drug and placebo. What if 10% of the worsening depressive symptoms and 5% of the dropouts were due to a nocebo response? That is a significant proportion of the trial subjects carried forward in an intent-to-treat design. Should nocebo response rates be calculated for all clinical trials? I think that they should and that data should be collected in a standardized manner as a part of clinical trials redesign in psychiatry. What happens in clinical practice? If a patient tells me that he or she is cutting up the lowest dose of a medication into sixteenths and can only tolerate 1/16 at a time due to side effects, I am not going to tell them to gradually titrate the dose up by sixteenths. I know that this is probably a nocebo response, and it will likely occur with other medications. I tell them to stop whatever they are doing immediately and we will try something else. That could be a treatment focus on insomnia, supportive psychotherapy, exercise, meditation, relaxation techniques, mindfulness approaches - anything but that medication. If a patient tells me that they are basically "allergic to everything" my approach is the same. I have no interest in prescribing a medication that makes a patient feel worse, irrespective of the purported clinical phenomenon. Often, the patient's response is surprise. Many people with these reactions are accustomed to physicians anguishing with them over the fact that they "cannot take any medication" and going through all of the excruciating misadventures associated with that nocebo response. I certainly don't. There are many other approaches and many other doctors who they can see. One of the behaviors that I have observed in this population is a tendency to seek out complementary medicine providers where there is a risk that nocebo responders will find other treatments that may be more expensive with no proven efficacy in the context of improved tolerability. There is also a tendency for non-psychiatrists to "kick the can down the road" and tell the patient experiencing a nocebo response that they have a psychiatric problem and need to see a psychiatrist. I think it is useful to discuss the placebo and nocebo effects with patients and provide them with as much detail as possible. I tend to focus on what is known rather than speculative neurobiology, especially in any conversation about endorphins. Endorphins have already been excessively hyped as being associated with the "high" associated with exercise but the evidence is weak (4). The opinion piece on placebo effects (2) is an interesting contrast. One of the authors of this piece is associated with the Program in Placebo Studies & Therapeutic Encounter (PiPS). A white paper on their web site describes their observations about the placebo effect and an action plan to conduct further research and a possible introduction of it as an action plan in medicine. In the opening paragraphs they allude to the theoretical neurobiology of placebo effects including the early genetics of placebo responders. They summarize three major findings of current research on placebo effects. The first is that they are not curative. The best example of this was the placebo effects with asthmatics. Their subjective symptoms are relieved but their forced expiratory volume in one second (FEV1.0) - stays the same. The same is true of placebo in cancer treatment where the side effects of treatment improve but there are no changes in tumor size. The second is the expectation effect, best illustrated by an example the authors give having to do with rizatriptan - a standard migraine medication. If the active drug is labeled "placebo" the results are no better than placebo. If the active drug is correctly labeled the antimigraine effect increases by 50%. They list a number of medications with similar expectation effects. Lastly, they touch on the nocebo effect as "the psychosocial factors that promote therapeutic placebo effects also have the potential to cause adverse consequences." In a clinical trial of finasteride for benign prostatic hypertrophy, patients informed of sexual side effects report them at three times the rate of men who have not been informed. They quote the statistic that 4-26% of placebo treated patients in clinical trials discontinue the study due to perceived side effects. The philosophical aspects of this commentary are probably the most interesting. The authors correctly point out that the placebo effect has pejorative connotations. There is perhaps no better example than in psychiatry. They suggest a further understanding and application of the various facets of this response to create a better therapeutic alliance with patients and alleviate their suffering. This is a fascinating area of psychiatry. I am generally compulsive about informed consent in general and more so in high risk situations. For the highest risk warnings that I give patients - serotonin syndrome, tardive dyskinesia, agranulocytosis, cardiovascular complications, seizures, renal failure, and liver failure - I have never seen a nocebo effect. That may have to do with the clear objective markers of these problems or the fact that I describe them as rare complications. On the issue of sexual side effects, I clearly explain what they are and give people the exact numbers from clinical trials. When it comes to explanations about medication side effects, the one that leads to the most problems is increased appetite and weight gain. Even though that side effect is common with medications that psychiatrists prescribe, people tend to flee from it independent of the statistics and how much weight they have recently lost or gained due to either the primary psychiatric diagnosis or substance use. It seems that most people who are likely to be nocebo responders, are well known before it gets to the informed consent stage. In the initial evaluation stages they have clear histories of not be able to tolerate much of anything and the side effects described are very atypical. Another area where placebo-nocebo comes into play is when the primary disorder has been treated and a patient presents with the idea that the "medication has lost its effect". There are papers written on this effect and some give statistics about how often it occurs. In my experience, these outcomes are most often not due to a medication, but prevailing psychosocial factors and/or substance use. Clarifying and addressing those issues frequently leads to better outcomes than changing medications or adding another one. In many way it seems that some elements of a placebo response are an antidote to psychosocial stressors that affect medication responses. Translating life into a medication mediated process needs to be averted at all costs. 1: Dodd S, Schacht A, Kelin K, Dueñas H, Reed VA, Williams LJ, Quirk FH, MalhiGS, Berk M. Nocebo effects in the treatment of major depression: results from an individual study participant-level meta-analysis of the placebo arm of duloxetine clinical trials. J Clin Psychiatry. 2015 Jun;76(6):702-11. doi: 10.4088/JCP.13r08858. PubMed PMID: 26132671. 2: Kaptchuk TJ, Miller FG. Placebo Effects in Medicine. N Engl J Med. 2015 Jul 2;373(1):8-9. doi: 10.1056/NEJMp1504023. PubMed PMID: 26132938. 3: Ioannidis JP. Effectiveness of antidepressants: an evidence myth constructed from a thousand randomized trials? Philos Ethics Humanit Med. 2008 May 27;3:14. doi: 10.1186/1747-5341-3-14. PubMed PMID: 18505564. 4: Harbach H, Hell K, Gramsch C, Katz N, Hempelmann G, Teschemacher H.Beta-endorphin (1-31) in the plasma of male volunteers undergoing physical exercise. Psychoneuroendocrinology. 2000 Aug;25(6):551-62. PubMed PMID: 10840168. The graphic in this case is from 2,000 Plus Royalty Free Images from the Apple App store. Unfortunately things rapidly fell apart after that point. The above statements capture much of the position I have advocated on this blog from day one. Anyone who is not aware of the purely political factors affecting some of the conflicts outlined in these sentences is extremely naive. If anyone needs a more extensive scorecard, please refer to the graphic at this link. On the other hand, the problem may be that I have a restrictive view of what the authors here refer to as "our specialty". They seem to include a lot of other people than just psychiatrists. Midwestern psychiatry may be a different culture than the rest of psychiatry. I think we tend to view ourselves as physicians first and then psychiatrists. We may be more comfortable talking with medical and surgical colleagues and medical knowledge is valued rather than denigrated. We don't claim medical knowledge for the political advantage of seeming to be like other doctors. We know a lot of medicine because we treat a lot of people with psychiatric and medical problems and consult in acute care settings. Some of the conferences I see advertised and a few I have attended suggest to me that there are psychiatrists out there who do not have that interest in all things medical and neurological and may be more comfortable talking with non-physicians. When I think about "our specialty", I am thinking about those hundreds of medically oriented psychiatrists who I know who want to talk about taking care of people with severe illnesses. People who are comfortable in hospitals and medical clinics. People who know about the brain, labs, brain imaging, EEGs, and all things medical. You might think that this is just another "faction" of a fractionated specialty, but it has been surprisingly seamless to me. I trained in three major University settings in their core hospitals and affiliated Veteran's Hospitals. When I got out, I practiced in community hospitals and clinics before coming back to a University affiliated tertiary care center. The knowledge base of what needed to be diagnosed and treated was uniform across all of those settings. I could expect highly competent psychiatrists available in those settings to consult with and for cross coverage. The focus was always excellent clinical care and avoiding mistakes. It did not resemble the confederacy of dunces described in this editorial and frequently in the popular press. The practical issue is that practicing in acute care settings focuses the type of care that needs to be delivered. People need to get better, and they need to get better in a hurry. All of the debates wash out in the bright light of pragmatism. If your plan cannot be enacted and result in clear improvements, you don't last long in that environment. The potential complications alone will make you look bad. The results of a clinical trial of a medication in completely healthy adults is irrelevant. Turning the management of the world's most expensive health care system over to a for-profit industry capable of skimming hundreds of billions of dollars off the top for what amounts to a rationing scheme is a uniquely American solution, so I would not expect a lot of recognition in a British journal. Medical journals make it seem like we are all practicing the same brand of medicine independent of cultural and political constraints. I doubt that the editors in these situations will prove any more savvy than American editors who seem to ignore the fact that, managed care and everything that involves dwarfs the pharmaceutical industry in terms of conflicts of interest affecting the care of patients at least in the United States and that pro-managed care articles deserve at least as much scrutiny as papers written about pharmaceuticals. The authors use about 1/3 of their space to criticize Rosenbaum's New England Journal of Medicine series on conflict of interest and the term pharmascolds. They get one point correct, good research should not be ignored irrespective of who is funding it. Like other critics of Rosenbaum, they wax rhetorical in their criticism and side step the numerous valid points that she makes. 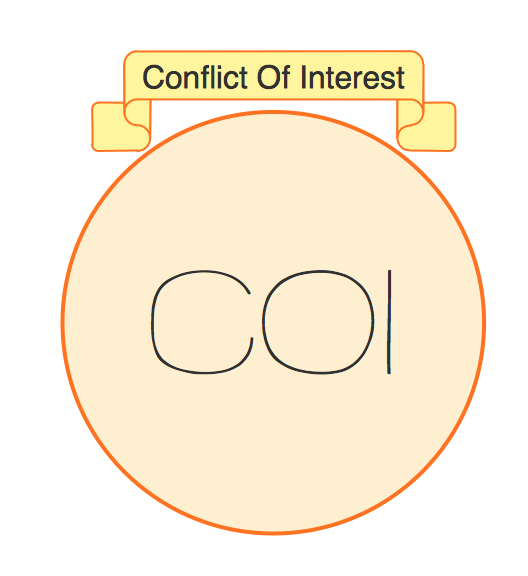 They suggest that they should be focusing on a larger number of conflicts of interests ranging from the potential financial gains from various non-pharmacological innovations to "professional vendettas" but provide very little insight into how that might occur other than continuing to "question, query, probe, and interrogate" beyond the usual financial conflict disclosure. On that procedure, I will say good luck to them and editors everywhere. The Institute of Medicine inspired approach (2) of considering the appearance of conflict of interest and conflict of interest to be equivalent and unevenly applying that to one industry while completely ignoring the insidious effects of another has done very little to "strike the right balance between addressing egregious cases and creating burdens that stifle relationships that advance the goals of professionalism and generate knowledge to benefit society." There is no better example than a health care system that systematically discriminates against mental illness and addiction and does that on the basis of questionable research based on business rather than scientific principles. The editors could start to expand their probing to spreadsheet research that looks at the purported "cost effectiveness" of managed care or collaborative care and question any associated reported quality measures. It is always amazing how new research compares a relatively trivial case management intervention to "care as usual", when that terrible care was the product of early research on how care can be rationed. A good starting point might be a requirement analogous to "refusing to publish non-research articles on depression from authors who have received unrelated funding from pharmaceutical companies that market antidepressant." by refusing to publish opinion pieces from opinion leaders in the business of rationing mental health services. Refusing to publish research articles that compare rationed to less slightly rationed care would be another. If medical research is really supposed to be generating knowledge that benefits society, where are the state-of-the-art models for psychiatric care that can set this standard? That is what editors everywhere should be looking for. 2: IOM (Institute of Medicine). 2009. Conflict of Interest in Medical Research, Education, and Practice. Washington, DC: The National Academies Press. This article (2) caught my eye in JAMA Psychiatry. Stimulant (methamphetamine, cocaine, prescription stimulants, and various synthetics) use disorders (previously called addictions) are difficult problems to treat. That is especially true because of the epidemic of adult Attention Deficit~Hyperactivity Disorder diagnoses and the cross contamination from the cognitive enhancement movement as well as new indications for stimulant prescriptions. Stimulant medications are widely available and generally work at some level for most people who take them leading to the common impression that: "I took my cousin's Adderall and it worked! Therefore I must have ADHD and need my own Adderall prescription." By the time that has happened it is usually very difficult for any physician to explain to this patient why a positive response to a stimulant does not equate to an ADHD diagnosis, especially if the prospective patient has been functioning at a high level and is presenting for diagnosis and treatment after doing extremely well in college and their first few years of professional school. 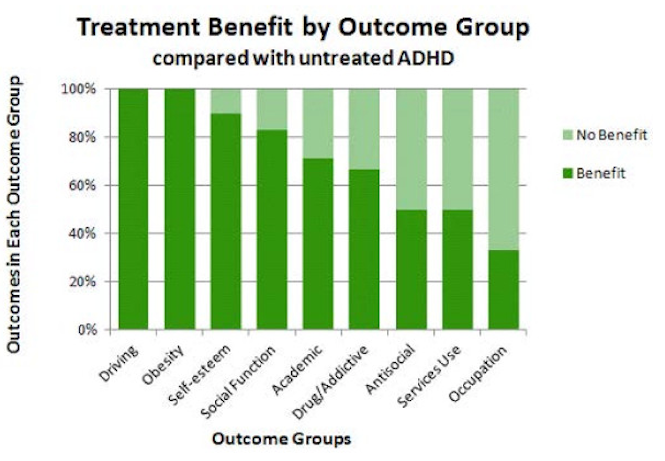 A second problem with the ADHD stimulant use issue is the misconception that people with "true" ADHD are less susceptible to the positive reinforcing effects of stimulants than people without ADHD. There are certainly subgroups of person with this diagnosis that do not like to take stimulants. They find that stimulants decrease their appetite, given them increased anxiety and insomnia, and in many cases leave them feeling more restricted, affectively blunted and less spontaneous. I find that these patients are generally selected out by the time they are adults. They had true ADHD diagnoses in middle school, did not like the stimulants, or in many cases their parents did not like the effect they were seeing and they were taken off of them. They may have developed significant coping strategies based on their dislike of stimulant effects. Like many adult psychiatric disorders there is no one uniform phenotype, and the phenotype of the person who was diagnosed either as a child or an adult and who gets a euphorigenic effect from stimulants and escalates the dose clearly exists and is seen in treatment centers. In many cases they have an iatrogenic diagnosis of bipolar disorder from a pattern of taking the month's prescription of stimulant in the first one or two weeks and then either going into withdrawal or using a depressant like alcohol, benzodiazepines, or opioids to treat the dysphoria and cravings associated with stimulant withdrawal. There is also the situation where a person has been using high dose prescribed stimulants (taking more than prescribed) or using high doses of meth or cocaine off the street, where they develop a residual state that is identical to ADHD, but where the cause of the ADHD is the stimulant. I think it is an error to treat that residual state with stimulants. That residual state is generally associated with a profound level of impairment and lack of insight. The patient is aware of significant cognitive problems, attributes them to ADHD and often insists on treatment with stimulants despite a clear addiction to stimulants. They may insist that years or decades of stimulant use was their attempt to self diagnose and treat their own ADHD. It is very common for patients with substance abuse problems to give a history of no formal diagnosis in childhood, no school or occupational impairment, but to offer the opinion that they think they may have ADHD. All of these considerations lead to associated problems in providing care to people who have clear ADHD and stimulant use diagnoses. 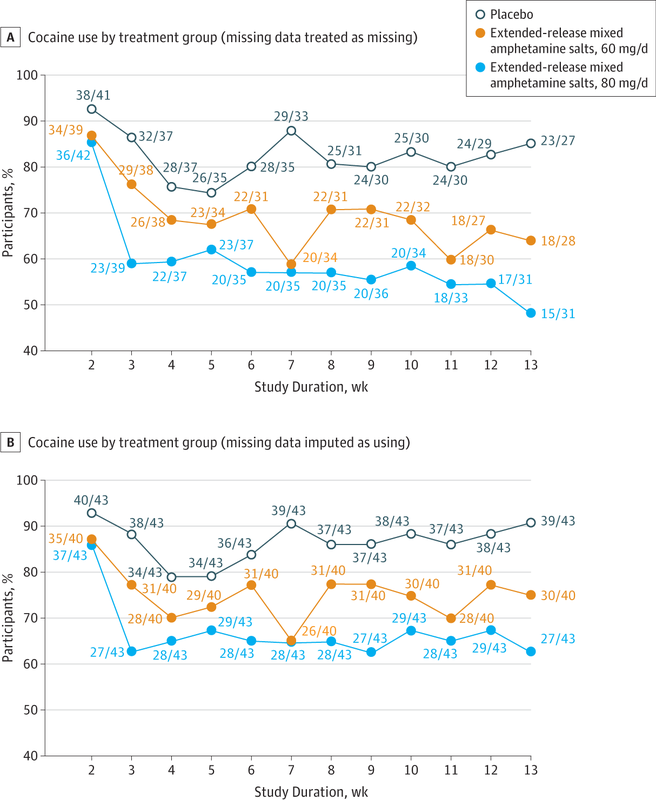 That leads me to this multisite study (2) on the effects of high doses of extended release mixed amphetamine (ER MA) salts on both ADHD and cocaine use in patients who have both of these diagnoses. The doses used were 60 and 80 mg/day. The most commonly used current prescription versions of these drugs typically recommend a maximum dose in adults of 30 mg/day (1), but interestingly there is a "titrate to tolerability" statement in the package insert of a drug where 20 - 60 mg/day were used in trials with the statement "There was not adequate evidence that doses greater than 20 mg/day conferred additional benefit." The authors describe their dosing selections as "robust" and suggest that there is evidence that higher doses are needed to treat cocaine use problems. "Participants with blood pressure higher than 140/90 mm Hg or heart rate higher than 100 beats/min for 2 weeks or with single readings of blood pressure higher than 160/110mmHg or heart rate higher than 110 beats/min were discontinued from study medication." 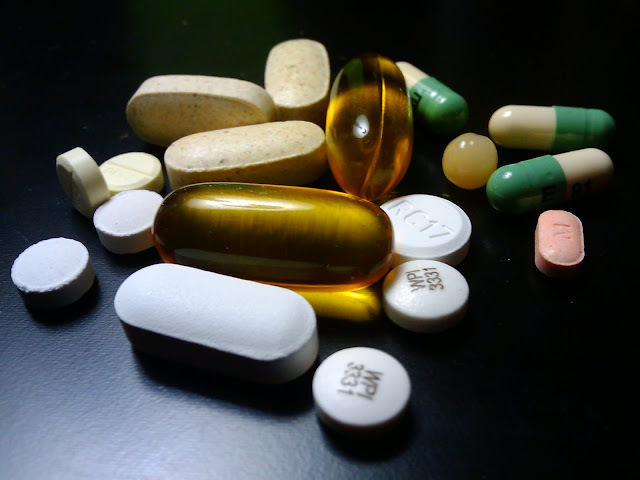 It is always shocking to hear from a person who has been on stimulants for years that nobody has ever checked their blood pressure or pulse, especially when they are sitting in front of you and are hypertensive and tachycardic. This basic procedure should be done on any person taking stimulants, antipsychotics, antidepressant and for that matter any CNS active drug. If similar effects are noted with any of these medications they should be discontinued. Another important aspect of this study is that although the patients were well screened, they were complex from a substance use standpoint with current alcohol (18.6 - 27.9%), cannabis (7 - 14%), and nicotine (45-65.1%) use disorders. The high levels of nicotine use are not surprising considering the epidemiological correlations between smoking and cocaine use and recent evidence about the epigenetic effects of nicotine in substance use disorders. The authors do not comment on whether there were different outcomes for the non-smokers in this study. High dose MA ER resulted in both a significant reduction in cocaine positive weeks over the 14 weeks of the study. The 60 and 80 mg doses were actually fairly equivalent form a statistical standpoint and both were superior to placebo in terms of ADHD and cocaine outcomes. But the real question is whether this is a reasonable clinical approach to this problem? This was an intent-to-treat analysis with significant drop out rates. The drop out rates are illustrated in the rapid decline in denominators in each group in Table 2. In my experience, a substantial number of patients with ADHD and either cocaine or amphetamine use disorder reach the end of the prescribing algorithm where they have failed or relapsed. In many cases that failure does not lead to a prescription being stopped for many reasons, a lack of information to the prescribing physician being foremost among them. In the real world there is no clinic that will follow patients three times a week with toxicology screens at most of those visits and offer them all cognitive behavioral therapy. Models currently funded by managed care companies and governments consist of patients being seen every one to three months for 20 or 30 minutes. Many of those visits are done by clinicians with little to no addiction experience. Within the medication maintenance literature, particularly with buprenorphine maintenance there are studies that suggest psychotherapy adds nothing to the outcomes. But even without that data what business manager would consider those therapists "cost effective" beyond the stimulant prescription? "Addiction is a chronic relapsing syndrome that moves from an impulse control disorder involving positive reinforcement to a compulsive disorder involving negative reinforcement." A euphorigenic, hypomanic effect is usually the high risk positive reinforcer regardless of the substance taken. One of the theories of abuse deterrent approaches is that the pharmacokinetics of the substance used prevents rapid availability in the brain and this decreases abuse potential. Many abuse deterrent preparations fail because multiples of the dose can be taken and result in the positive reinforcing aspects of the addiction cycle. I consider the authors' paper to be elegant in its experimental approach. The graphic at the top of this page is first-rate as a source of information. It also illustrates the problem of coming up with a clinical trial that can be translated into practice. I would not consider implementing this strategy as a clinical approach until there was a long term study that looked thoroughly at all of the outcomes. At this time, I don't think the modest results of this short term study warrant the widespread practice of using extended release mixed amphetamine salts for cocaine use disorders. There are also legal issues with prescribing maintenance doses of controlled substances in order to "maintain an addiction" as some laws are currently written. I would have liked to see an attempt to characterize the subjective responses to methamphetamine use measured along with an analysis of whether the non-smokers did better than the smokers. 1: Drug Facts and Comparisons. Wolters Kluwer Health. St. Louis, MO, 2013. 1. The figure at the top of this post is from reference 2 above and is used with permission from the American Medical Association, License Number 3660331303348. Copyright © 2015 American Medical Association. All rights reserved.